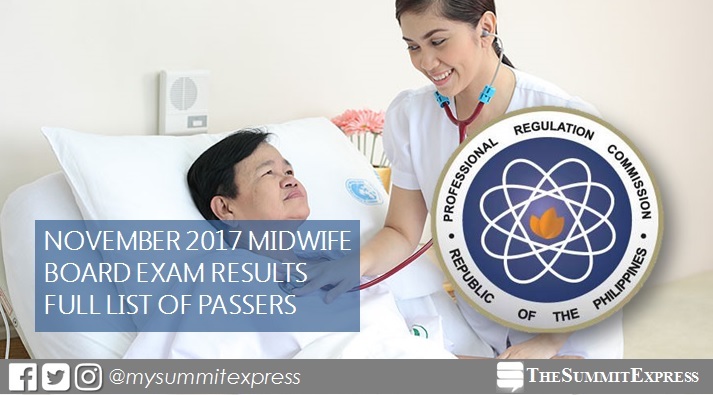 MANILA, Philippines - The November 2017 Midwife or midwives board exam results including the official list of passers, topnotchers (top 10), top performing schools and performance of schools were released today, November 8, 2017 or in three (3) working days after the last day of exam. As announced, 1,444 out of 3,360 passed the exams. The results of examination with respect to forty-five (45) examinees were withheld, per Board Memorandum dated October 30, 2017. PRC conducted the Midwife licensure exam in the cities of Manila, All Regional Offices and Zamboanga on November 4 and 5, 2017. From November 16 to 17, registration for the issuance of Professional Identification Card (ID) and Certificate of Registration will be done on-line. Please go to www.prc.gov.ph and follow instructions for initial registration. The two-day midwives board exam covered the following subjects: obstetrics, fundamentals of health care, infant care and feeding (November 4) and primary health care and professional growth and development (November 5). According to PRC Resolution No. 2016-1019, the target release of results for the recent Midwife board exam is on Wednesday, November 8 or in three (3) working days after the exam. In the November 2016 examination, results are out in 3 working days. 1,572 out of 3,085 passed the Midwife Licensure Examination. Maribel Doroja Sabenia of Estenias Science Foundation School - Casiguran Sorsogon topped the board with 90.10%. Results were also released in three (3) working days in the November 2015 exams. 1,273 out of 2,867 passed the tests. Arianne Mae Soriao Abella from Catanduanes State University (CSU) - Virac and Emarie Legson Villare, Speed Computer College - Magsaysay, Sorsogon City graduate tied on the top spot with 88.10%.